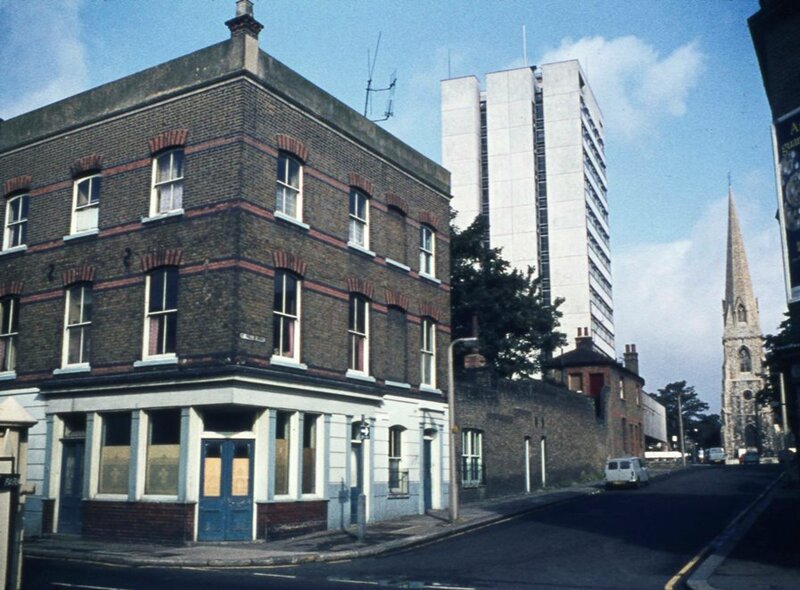 Peter Young's photo was taken on the 2nd September, 1973 and shows three phases of building: St Paul's Road was constructed in time for St Paul's Church to open in 1866; the Feathers PH on the corner at 232 High Street, was probably rebuilt after being bought by Fuller Smith and Turner in 1787; and the contrastingly modern Police Section house opened in 1966. This area is mentioned in Then and Now Brentford, p. 37 and The Feathers in Brentford and Chiswick Pubs: see Books etc. for more details. The Feathers was demolished in the early 1980s but the church and Police Section House survive; the latter provided accommodation for single police officers. The site has more information about the Feathers and its occupants and a search for 'St Pauls' at the top of the home page will locate other material about the area including St Paul's School.